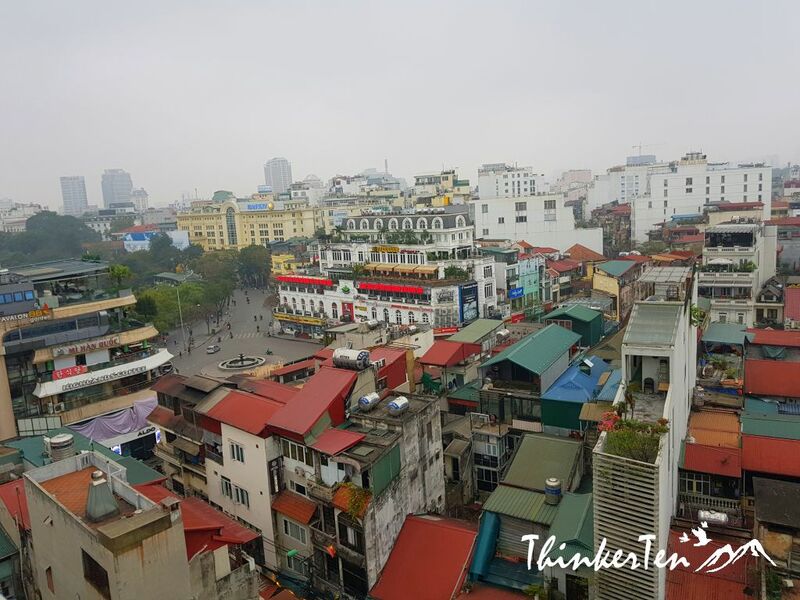 There are plenty of hotels in Hanoi. 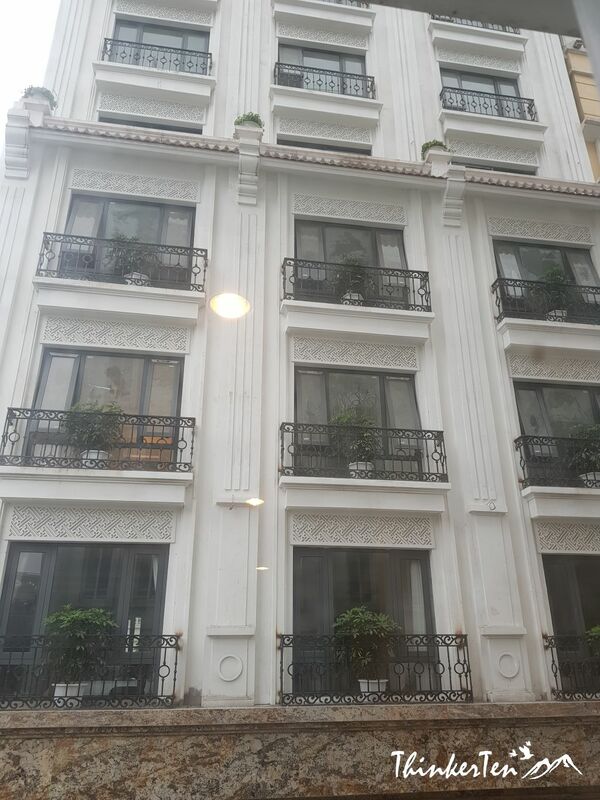 Most people would choose to stay in Old Quarter Hanoi and I too strongly recommend anyone to stay there. It is easy access to many tourist spots if you stay in Old Quarter, such as the iconic Hoan Kiem Lake and water puppets show. There are also a variety of streets food and fancy restaurants in Old Quarter. You can also shop around at the Hanoi Night Market which open on Friday, Saturday & Sunday start evening till midnight. 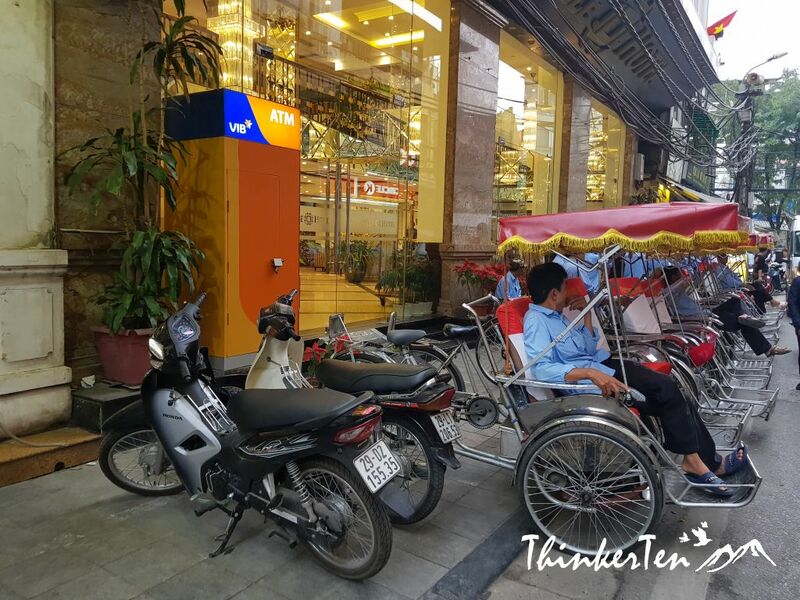 Since there are plenty of taxi scammed in Hanoi, it is best to stay at the heart of Hanoi which has easy access to many places by foot. The hotel which I choose to stay is called May De Ville Old Quarter. It is has a very good location. Room is spacious and clean. Staffs speak English and are friendly. There is a little bathtub in the bathroom. Shower head is running well and warm water is working well. 3 types of clean towels, hand, face and body towels are provided. Free toiletries such as toothbrush, small toothpaste, comb and shower cap are also provided. Complimentary mineral water is available everyday. Air-condition work well and the whole room is bright enough if you switch on all the lights. 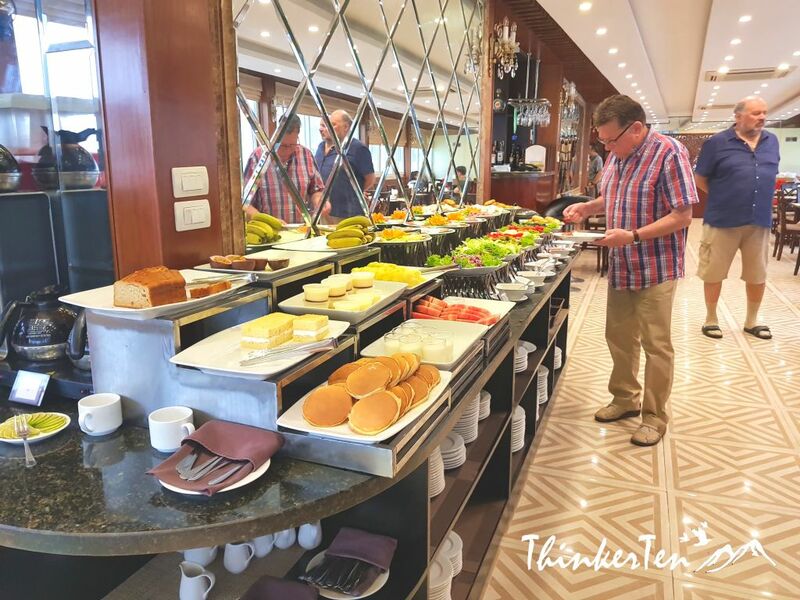 International buffet breakfast is available from 7 am onward. 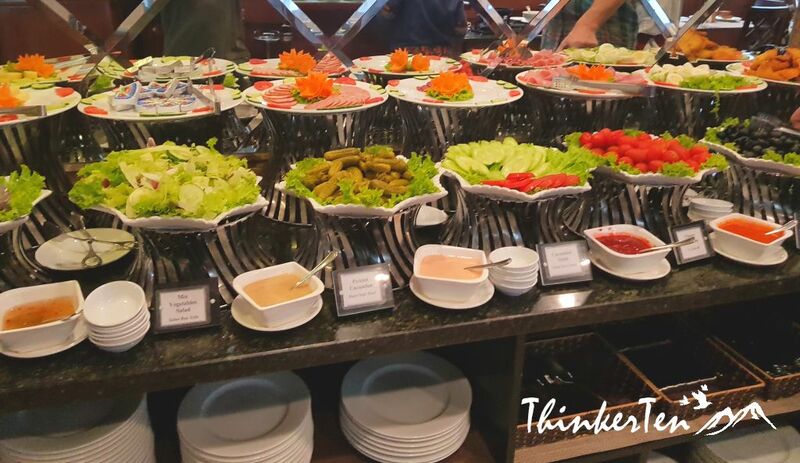 A variety of western and Vietnamese buffet for you to pick. The salad tasted fresh and come with few choices of salad dressing. Fruits, cakes, bread are also available. The choice is great. The guests who stayed there are from Europe, America, Singapore, Korea and Japanese. 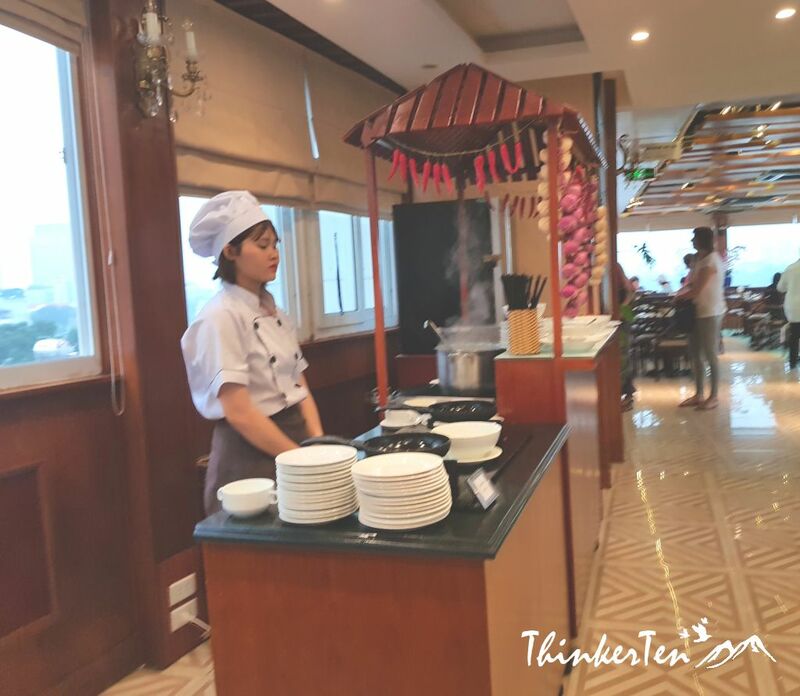 I didn’t find any big group of mainland Chinese in the hotel, at least I did not see them having breakfast in the morning. 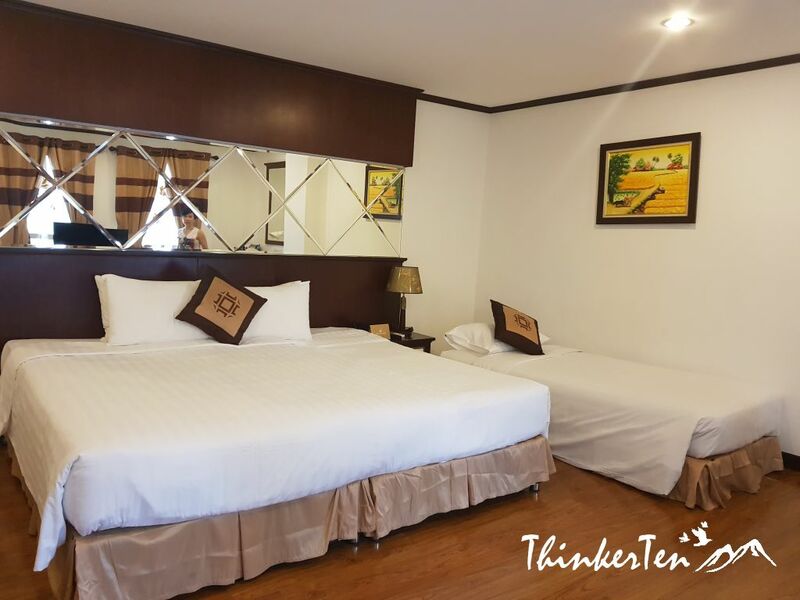 Most groups who stayed here are in small size, free and easy with family and kids or couples. There is a pho noodle corner which serve hot pho noodle or scrambled eggs. Pho noodles tasted very yummy and you should not missed. The restaurant for your breakfast is located at the highest floor. Next to the restaurant, you will find the swimming pool and some comfy chairs. 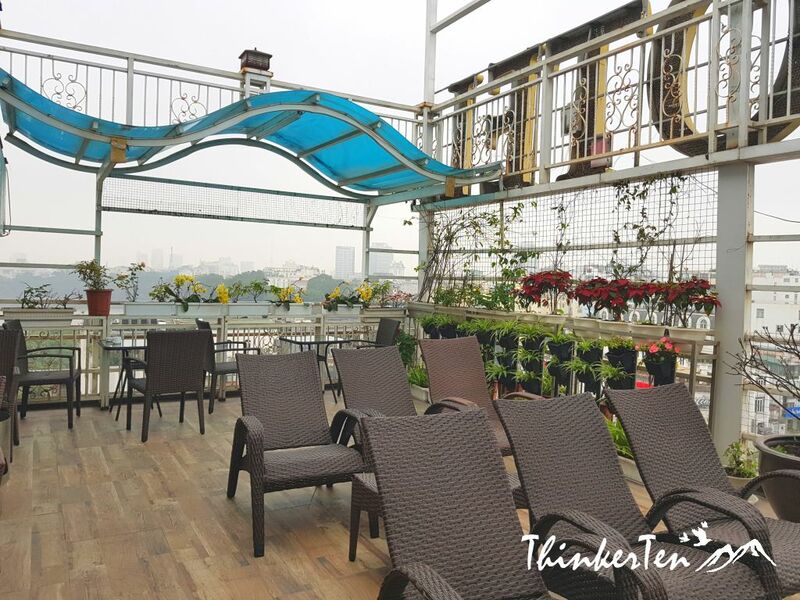 You can also take your breakfast out to enjoy at the rooftop pool. There is a small door which lead you to the swimming pool. The rooftop view at the swimming pool, also at the breakfast area. 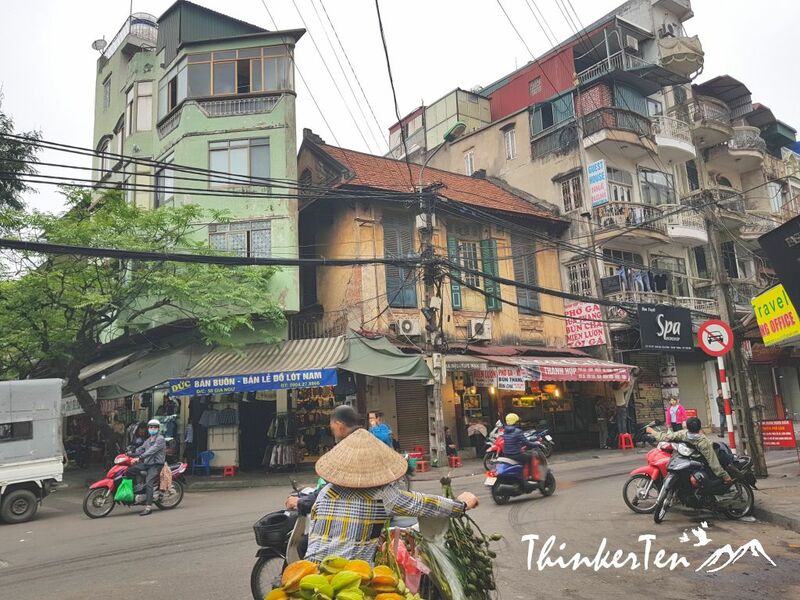 You are able to enjoy the whole Old Quarter Hanoi while having your breakfast in the morning. 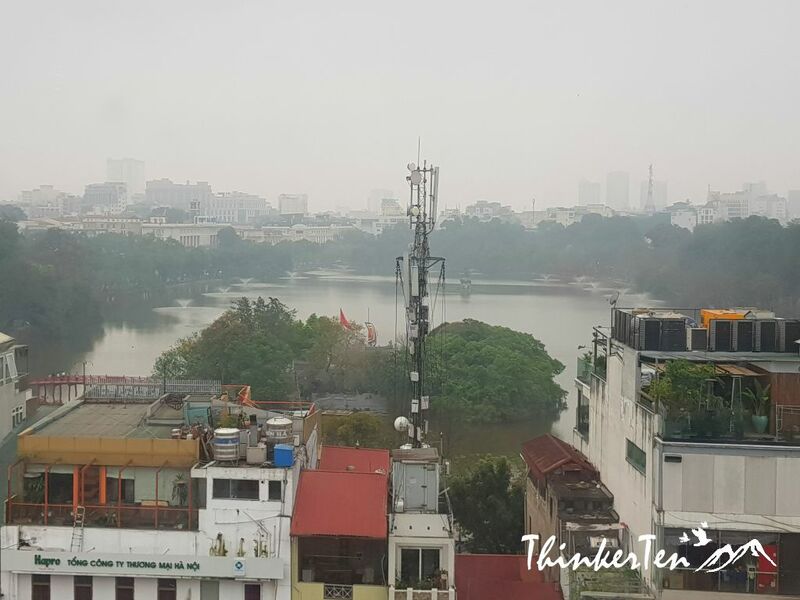 You also get a glance from the Hoan Kiem Lake view. For me, the downside of May De Ville Hotel is the noise level from the main street. The honking of the motorbikes and cars did not stop till 1 or 2 am. Do mention that you do not want any room from the main road. If you choose to stay at the side or back, the noise level may not be so horrible. One more tips in booking hotel, apply to all hotel in this world. Do check the comment from the guests that has stayed there before. For me, I would pay extra attention to the comment coming from the other fellow Singaporean as their view should be similar to mine since we share the same culture. Booking Resources : – Click to book via the link below to help me out as I have affiliate program with Agoda, AirbiB, Booking.com & Klook. Klook – booking for day tours or tickets for museum/theme park. It would be interesting to see Vietnam ever. Good article about hotel, good photos. Great review! I’m travelling Vietnam in 2 weeks time so this is really useful!! Looks like an absolutely great place to stay! Thanks for your recommendation, I will most certainly follow it if I’m ever there! Wow! The pool deck itself just sold me on this location! Such a cool vibe, and I love the views of the city! 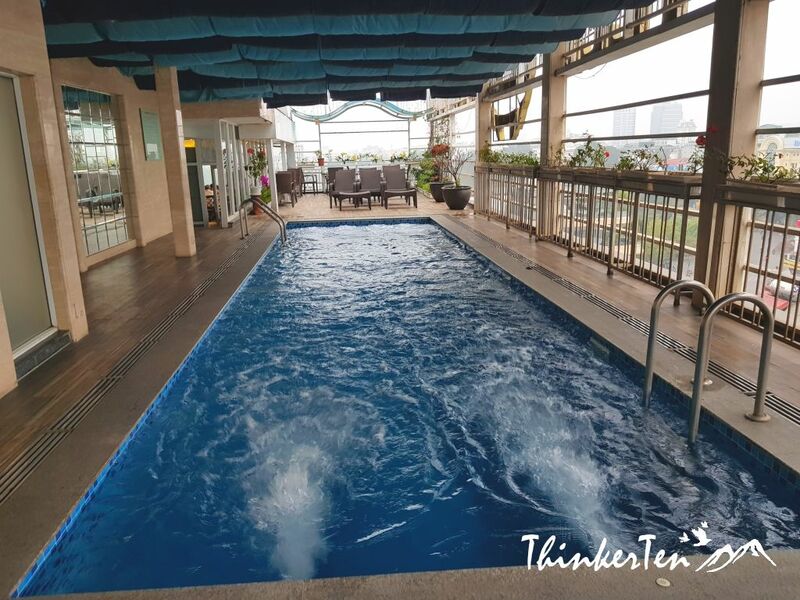 That rooftop area and swimming pool are awesome! 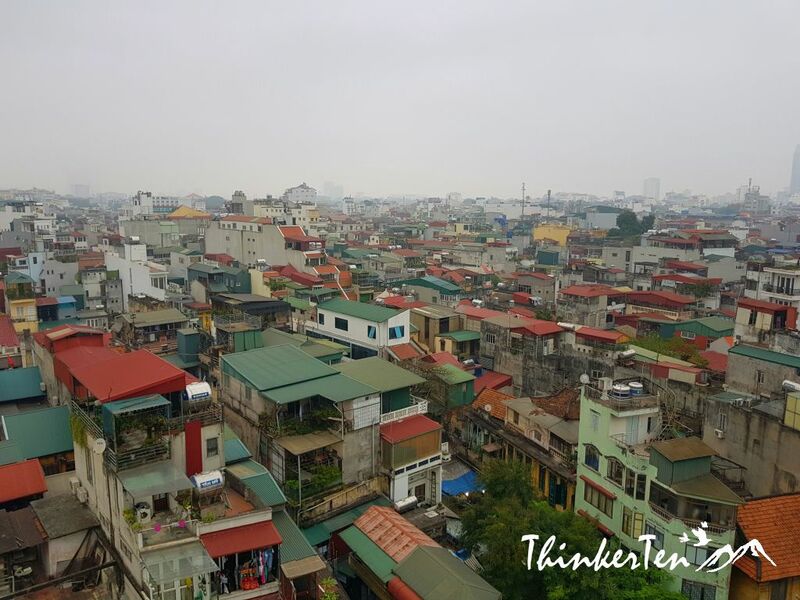 This looks like the perfect place to stay in Hanoi. 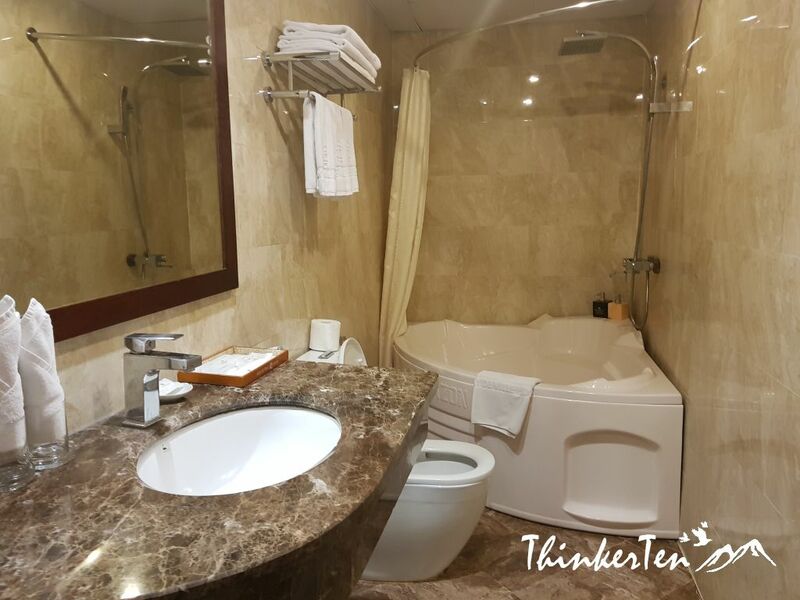 What a great hotel to stay in when you’re in Hanoi. The photos are excellent too. How neat!! I love the tub in your room! My husband’s grandma is from Vietnam and he would love to travel there someday with me. Fantastic review!!! I’d love to visit here one day because it looks like a really fabulous place to visit. Looks like a wonderful hotel to stay in while in Vietnam. 🙂 I love the food selection in their buffet! This looks like a lovely place to stay. The swimming pool is so inviting. It seems like you had a really nice stay. That hotel is really awesome, it looks like that this place is really offered you an excellent service and those places in that hotel are so nice. I like it I hope to be there, someday! This is a great looking hotel. My friend went to Vietnam recently for work and had excellent things to say. Looks and sounds like a lovely hotel stay – love the bath and pool – luxury! One of my friends just went to Vietnam recenty and she told me its fantastic there. Everything was perfect but apparently the hotels are keeping client’s passport. I’d like ot know if this hotel is the same as others as well. Anyways, It looks really cozy and relaxing would love to stay here for several nights. Many of the hotel in Asia has the facilities where hotel front would help the guests to keep their passports in their master deposit safe. Few reasons for keeping the guest passport at the front desk during your stay. One reason is probably there is no safe lock in the individual hotel rooms and believe me the front desk hotel look after your passport better than you would yourself. However May De Ville Hotel did not ask to keep my passport. They just asked for passport upon check in and return.